The exhibition wall at Cafe 52 features new artists on a quarterly basis. The artworks are available for sale unless specified otherwise. Please feel free to contact Cafe 52 for inquiries regarding sales, exhibition opportunities, etc. 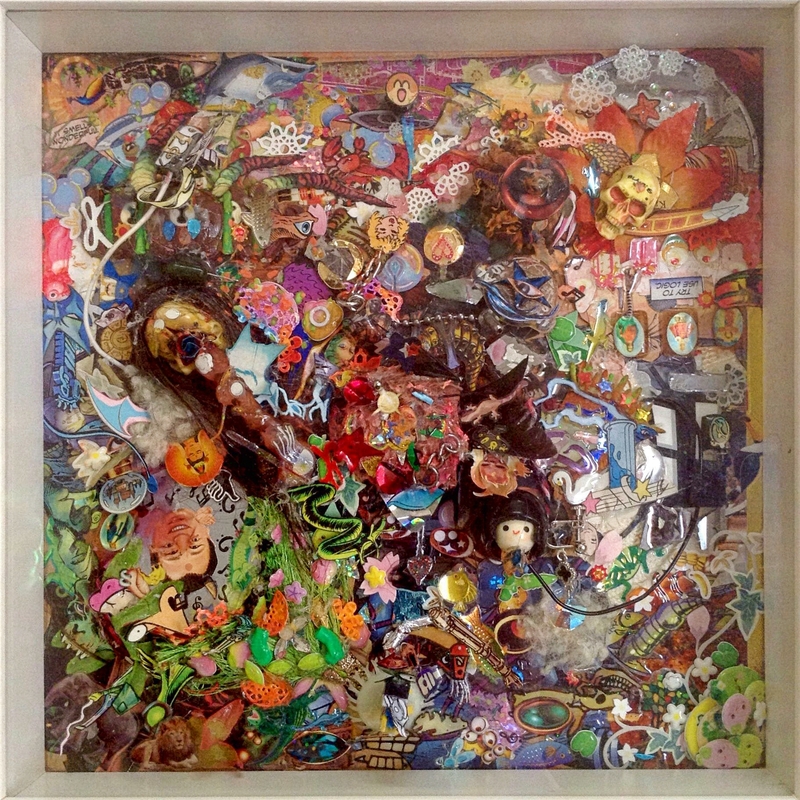 Logan Fulcher is from Colorado, USA and currently resides in Yokohama, Japan. He is a professional full-time artist/teacher/student/business owner, and part-time amateur dancer/priest/youtuber/terrible bowler and the list continues growing. Logan is composed of a million pieces: he is the sum of everyone he has met, plus a thousand hobbies. At any given time, he could be creating a board game, break dancing, scrawling manic poetry, painting an abstract maze of colors, bending wire into the outline of a face, molding cute mushrooms from clay, or speedily cutting delicate pieces of magazine for a collage. In this barrage of activity, while most would become overwhelmed by the frenetic machine-gun focus, he is able to span vast mediums of creativity and professional fields. For him, creativity is not just an artistic characteristic, it is a lifestyle. 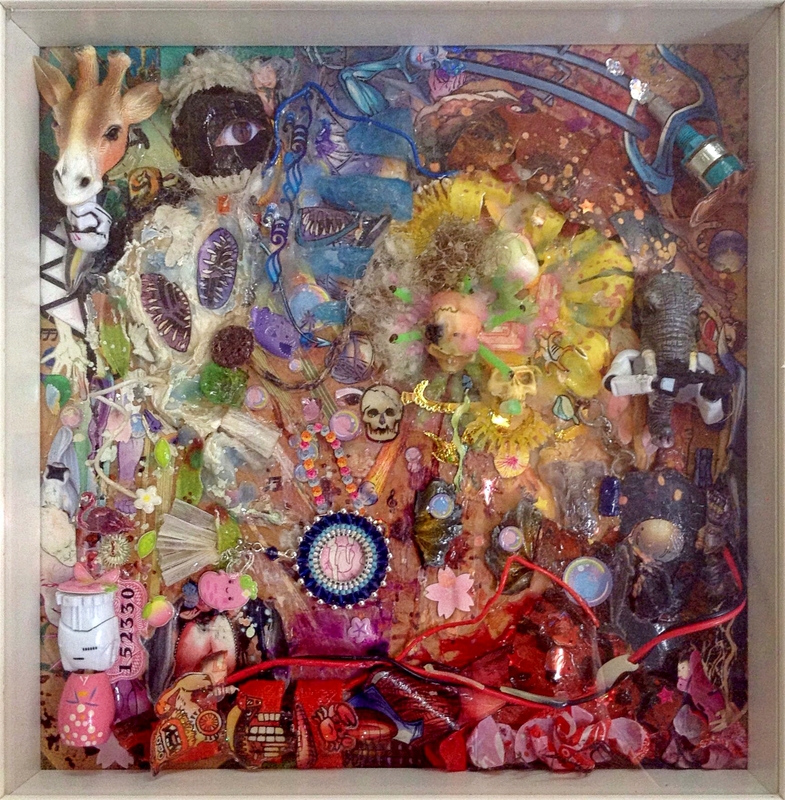 Stickers, comic book pieces, flower petals, rust, various electronics components, wire, figurines, key chains, earrings, glue, water colors, pen, crow feather, tissue paper, on wood board.